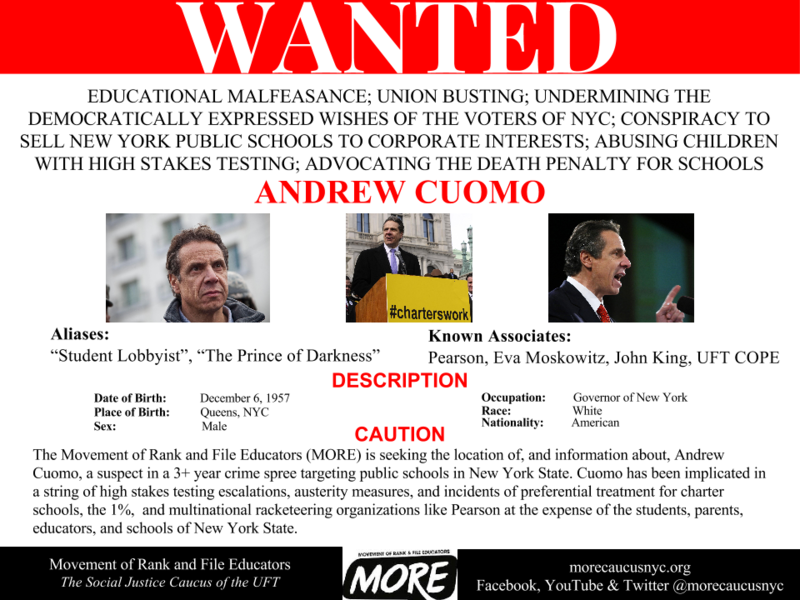 Print it and distribute to upcoming NYSUT convention. Great work! 9. Interfering with a duly appointed corruption commission. 10. Pulling the plug on same when it started to hit too close to home. This is amazing! The very use of a Wanted poster for men and women who claim to be interested in the lives of people that they have the right to change for the great common good, and instead back out to corporate and big business interests is quite telling. We should shame all those GOP crazies and their hypocrisy. Thank you so much for standing up. I stand with you, and will continue to work with you when I am called. In the meantime, I have to do some research on these hypocrites that we call our congress men and women, governors, like Andrew Cuomo, and others around the country,…etc. I am going to go more local. A principal I know, has created an environment in his school that fails to protect students and teachers–assault after assault. He has grossly mismanaged the school, which he is slated to phase out in 2015, and now is interviewing teachers for positions in a school that he is being allowed to open. A woman at a school where I have worked, as a rotating ATR, told me that he interviewed her for the phase out school and when she rejected his proposal, some time afterwards, he asked her if she would like to work at his “new” school that he will be opening up soon. This news is worrisome and needs a deeper look. What’s most shocking to me is that he is being investigated by both his supervisor and the the City’s Special Investigation unit. I know. They sent me a letter with an open file on him. When I have all of my evidence, and I’ve fact checked it, I will be sending his Wanted poster to our mayor. I have to act quickly, as I don’t have much time. Education Reform Now will convene Camp Philos in Lake Placid, NY. Embark on three spring days of fun, fellowship and strategy with the nation’s thought leaders on education reform. The exquisite and secluded Whiteface Lodge, which ranks among North America’s top luxury destinations, is nestled in the majestic woods of our country’s largest wilderness park. Is schizophrenia a crime ? Let’s start a “WANTED LIST” of the enemies of democracy and public education. We can have teachers post them on their lunch room bulletin boards etc. Post them on FaceBook pages and send them around to teacher blogs.